Last night, two men tried to force my shutters. I recognized them: they are two of Rodin’s Italian models. He told them to kill me. I am in his way; he wants to get rid of me. You know what black hatred women feel toward me as soon as they see me, until I return inside my shell, they use every possible weapon. As soon as a generous man tries to help me out, a woman is here to hold his arm and prevent him from acting. You see that it is not at all like Rodin… I share these only with you, don’t show them. I would have preferred to be successful here with a piece that cost me a huge amount of money and effort… rather than sending to Bohemia some ordinary works. I tolerate my faults but not at all other people’s. I sleep completely naked to make me believe you are here, but when I wake up it is not the same thing. Most of all, don’t deceive me with other women any more. I have had the problem of seeing my male model go to Italy and… stay there. 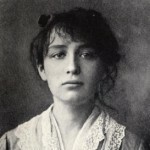 Camille Claudel was born in Fère-en-Tardenois, Aisne, France. She was a French sculptor and graphic artist. Fascinated with stone and soil as a child, as a young woman she studied at the Académie Colarossi with sculptor Alfred Boucher. In 1882, Claudel rented a workshop with other young women, mostly English, including Jessie Lipscomb. Alfred Boucher became her mentor and provided inspiration and encouragement to the next generation of sculptors such as Laure Coutan and Claudel.